DHT Elevator Co., Ltd. is a backed with high cost performance and the distinctive managing concepts. The products are well-received by vast customers because of the flexible sales policy and the humane service. The company is developing in leaps and bounds. Suzhou DHT V8-o observation elevator is developed on the basis of V8 passenger elevator, which changes car shape of V8 while maintaining its complete advanced functions. The installation type can be outdoor close type or indoor open type, depending on installation site. Machine roomless design is available, making it applicable for both new-type well in new buildings and old-type well or reconstructed well in old buildings. To better suit the style of your building, we provide several car shapes for you to choose from, including rectangle shape, diamond shape, and circular shape etc. Special car shape is also available on customer's request. We are a renowned observation elevator manufacturer in China. In addition to observation elevators, we also provide passenger elevators, commercial elevators, residential elevators, and so on. 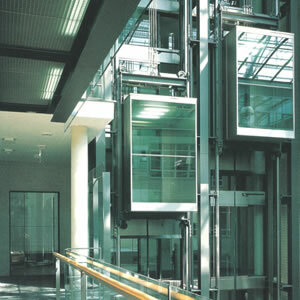 What's more, we can manufacture elevators according to customers' specific requirements. As a result of our high quality products and dependable service, we have been awarded ISO9001: 2000 certificate. Thank you for visiting our website. Please don't hesitate to contact us for more information!